With the rapid economic development of the last twenty years resulting in the accumulation of great wealth, China urgently feels the need to move from a manufacturing-driven economy to an innovation-driven one. As a result, China is supporting many bold research initiatives in an effort to develop and attract the highly skilled individuals who will be needed to lead this transition. Thanks to recent dramatic developments in hardware and software, economists anticipate that the Chinese robotics industry will meet its spring season this year. Every five years, the central government of China releases a new Five Year Plan, which establishes the core concept of development in all areas of Chinese society. In 2011, China started its 12th Five Year Plan, and for the first time ever, the service robot was ambitiously identified as an important area for development. As such, it is anticipated that many new Chinese robotics companies will emerge in the near future to meet the growth targets set out in the plan. However, due to the economic crisis, the situation is changing subtly. I traveled around several main cities in China in early 2013 to learn from experts in the current automation industry, and it was apparent that because the new generation of Chinese workers asks for higher pay and lower workloads, it is very difficult for China’s massive manufacturing industry to recruit new workers. Not surprisingly, leading foreign industrial robot companies, such as Kuka, ABB, and Fanuc are taking advantage of this problem to actively market their robots to the manufacturing sector. While China’s industrial robot market is growing, service robots still remain the province university labs and research institutes. Local companies are likewise developing Chinese industrial robots that may have relatively low performance, but which are nonetheless able to meet industrial requirements. One such example is the Million Robots Project from the Chinese electronics manufacturing giant Foxconn. Yet, while the industrial robot market is growing, service robots still remain the province university labs and research institutes. In China, almost all high-risk, high-reward research is conducted by central government agencies: the National Natural Science Foundation of China (NSFC), the Ministry of Education (ME), the Ministry of Science and Technology (MST), and the Organization Department of CPC Central Committee (ODCCC). NSFC aims to support outstanding young researchers through the awarding of modest grants from the Young Scientists Fund. This is the most popular funding mechanism for young researchers when they first begin conducting independent research as it is relatively easy to apply for and receive. The Ministry of Education manages several projects, such as the Research Fund for the Doctoral Program of Higher Education of China (for new teachers), and the Chang Jiang Scholars Program (CJSP), which is supported by the Program for New Century Excellent Talents in University (NCET). For example, the CJSP tends to recruit top young and mid-career researchers both in and out of China to work as academic leaders, and awards sizeable grants to them. The Ministry of Science and Technology manages several projects that are significant to researchers engaged in high risk, high reward research, including the National Basic Research Program of China (973) and the National High Technology Research and Development Program of China (863). The influence of 973 and 863 on Chinese scientific research is far-reaching, and only top-tier professors with excellent teams are considered for funding by this elite program. Because research funded by these projects is carried out by large groups of people, 973 and 863 usually give out significant funds, in the order of millions of dollars depends on the scale of the project. The ODCCC funds high-risk research initiatives through the Thousand Talent Project (TTP), a three-year term project with possible extension. The goal of the TTP is to recruit thousand of foreigner researchers with strong expertise in hardware and software to help develop innovation in China. There are already more than 100 foreigner researchers working in China since 2008, the year TTP started, including Prof. Toshio Fukuda, a former IEEE RAS president, director of the IEEE Division X, who was invited to Beijing Institute of Technology (BIT) to work on Micro-nano research. It can be difficult for people outside of China’s borders to learn about the projects these granting programs support because, due in part to language barriers and visa restrictions, Chinese researchers tend to participate in domestic conferences rather than international ones. While robotics researchers from around the world keenly watch videos of Boston Dynamic’s Bigdog, the Chinese government is also busy establishing similar projects in a more low key fashion. Yet while robotics researchers from around the world keenly watch videos of Boston Dynamic’s Bigdog walking freely on uneven and slippery mountain roads, or Honda’s Asimo dancing and hopping on one foot, the Chinese government is also busy establishing similar projects in a more low key fashion (see this PlasticPals YouTube playlist for a fair sample of what the whole must be). Having visited Chinese laboratories and spoken face-to-face with researchers, I have witnessed several bold Chinese robotics initiatives that are currently underway. 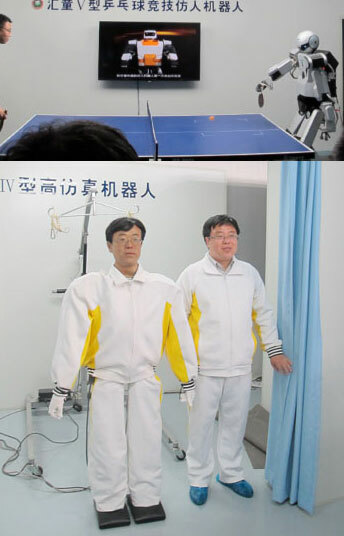 One particularly challenging area of development is the humanoid robot, and two of the best robotics laboratories for this in China are at the Beijing Institute of Technology (BIT) and Zhejiang University (ZHU), both of which have succeeded in producing the first humanoid robots that can perform Tai Chi and play Ping-Pong (see here and here). These robots were not specifically designed for game play – they were in fact developed as part of China’s domestic service robots initiative – but Tai Chi and Ping-Pong have helped researchers to test their robots’ image processing and dexterity. BHR-5 Humanoid (top) and BHR-4 Humanoid (bottom) by the Beijing Institute of Technology. I visited BIT’s robotics lab this past April, and saw their BHR-4 and BHR-5 humanoids in action. Using cameras couple with high-speed image trajectory processing software, a pair of BIT’s BHR-5 Humanoid can rally at Ping-Pong up to 200 times without error. The BHR-5s stand 162 cm (5’4″) tall, weigh 63 kg (139 lbs), and have 32 degrees of freedom. With its realistic animatronic face, BIT’s BHR-4 Humanoid, on the other hand, is more focused on conveying a variety of emotions that on speed and gross-motor dexterity. It reminds me of Prof. Ishiguro from Osaka University, Japan, who is the world leading robotics researcher in building humanoid robots with lifelike appearance and visible behaviour. The BHR-4 stands 170 cm (5’7″) tall, weighs 65 kg (143 lbs), and thanks to all the moving parts in its face, has an incredible 43 degrees of freedom. China is also pursing its own version of BigDog. In 2011, the 863 program established another 3-year project with funding up to $700US million that aims to build a Biomimetic Quadruped Robot like Boston Dynamic’s BigDog. Almost all the important robotics labs in Chinese universities are competing for this funding. The Harbin Institute of Technology (HIT), Shanghai Jiao Tong University (SJTU), Sheenyang Institute of Automation Chinese Academy of Science (SIA-CAS), Shan Dong University (SDU), and other universities and institutes each released their version of BigDog one after another. Various Chinese versions of BigDog. These homegrown initiatives may not yet have the performance capabilities of their better-known counterparts, but the Chinese are well on their way to catching up to the world leaders in robotics research. With contributions by Hallie Siegel.